Today, one of the most avid and discerning readers I know shares his “Best of” list for 2016. I’m taking notes. From Sean Kinch: I am a devoted reader of “Best of” book lists. Seeing what others consider the cream of the year gives me a chance to learn what I have missed and provides the inspiration to lift a title to the top of my pile. In 2010, the year-end issue of the Times Literary Supplement convinced me to pick up Edmund de Waal’s The Hare with Amber Eyes, which became one of my favorite books of 2011. A few years later, I succumbed to the chorus of praise for Elena Ferrate’s Neapolitan Quartet and quickly joined the ranks of her devoted fans. If your reading habits are anything like mine, the number of books you want to read far outstrips the available time, creating a competition among books to vie for your attention. Even the most industrious among us can’t read everything worthwhile. As many excellent novels as I’ve read in 2016, I’m haunted by the ones I haven’t, especially new works by perennial favorites like Ian McEwan, Jay McInerney, Ethan Canin, and (most recently) Zadie Smith. And 2016 isn’t finished: my Christmas vacation reading begins with Sabina Murray, a grad school comrade, whose new novel Valiant Gentlemen received thoughtful acclaim (“vigorous, audacious, and unpredictable”) from David Leavitt in the New York Times Book Review. Let these picks, then, score some points for the titles I mention. If you have never heard of one of them, add it to your list of possible future reading. If my recommendation is the fifth time a book has been pointed out to you, the universe is trying to send you a message. My 2016 reading was highlighted by two novels by Nashville writers. The year began on a high note in January with the publication of Only Love Can Break Your Heart, the first novel from my friend and colleague Ed Tarkington. My prediction is that, given its strong characters and elegant structure, it will be adapted by Hollywood. As much as I look forward to seeing the story realized in dramatic form (and to hear its Neil Young-heavy soundtrack), I recommend that you start with the novel to appreciate the nuances of Ed’s prose. This fall brought another local gem: Commonwealth, the new novel by Ann Patchett, Nashville’s Duchess of Parnassus. Readers tend to have intensely personal reactions to Commonwealth, making the novel a literary Rorschach test: everyone points to a different scene as her favorite, revealing hidden elements in the reader’s personality. My favorite moment is when Teresa Cousins acknowledges the beauty of her rival Beverly Keating by comparing Bev to Catherine Deneuve (personal note: did I marry my wife because she looks like Catherine Deneuve, or do I like Catherine Deneuve because she looks like my wife?). Read Commonwealth and experience your own revelations. Two novels from 2016 belong on a separate shelf from the rest; in Tour de France terms they are hors catégorie – beyond categorization. Julian Barnes, who lectured at Vanderbilt in March, returned with The Noise of Time, a fictionalized biography of the Russian composer Dmitri Shostakovich that is also a meditation on art, politics, history, and, as always with Barnes, the irreducible subjectivity of truth. Another all-time favorite, Don DeLillo, creates in Zero K the ideal vehicle to exercise his peculiar gift for describing liminal experiences: elective cryo-preservation. DeLillo characters tend to ask, “What does this mean?” His novels ask the more fundamental epistemological question: How do we mean? With White Noise, DeLillo showed us how pop culture obscures communication. Underworld proved that we are defined by what we throw away. Cosmopolis revealed the fictions that undergird the international finance system. With Zero K, DeLillo ponders our communal death wish, the “psychological pandemic” that pushes us toward existential crisis. The most impressive newcomer is C.E. Morgan. Though she had previously published a short novel called All the Living, the scope and ambition of her new novel The Sport of Kings seemed like a lightning strike, a novel that immediately elbowed its way into the American canon. Her multi-generational story, set in the milieu of horse racing, offers a jaundiced view of American race relations. At its intimate heart, though, it dramatizes how love, desire, anger, and loss complicate the already-hazardous business of discovering who you are. 2016 also saw the return of some Kinch favorites experimenting with new styles. Michael Chabon, recently featured in Nashville Library’s Salon@615 series, produced Moonglow, a faux-memoir of his “grandfather” that toggles among decades to tell the stories of three damaged people who persevere despite the fantastic, horrifying shadows cast by the Holocaust. Jonathan Safran Foer rendered a more contemporary vision of the destruction of Jewish people in Here I Am, where multiple threats to Israel’s existence form the backdrop to a marital crisis. The novel follows a pattern of splintering and healing – nations struggle but survive, families decay and then bloom in new environs – that leaves its hero broken but mildly hopeful. 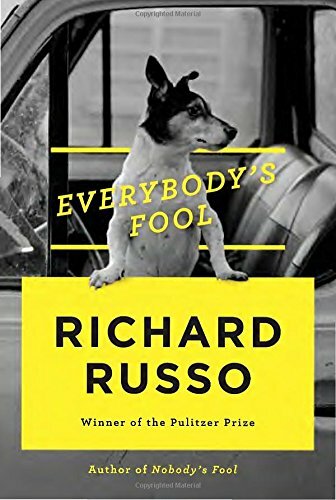 The novel I most enjoyed reading this year was Richard Russo’s Everybody’s Fool, which revisits the town of North Bath, made famous in Nobody’s Fool two decades ago. In this sequel, Sully’s old gang takes a back seat to a younger generation, but the new cast runs the familiar Russovian gamut of reprobates, cast-offs, and trainwrecks. Read it, re-read the original, watch the Paul Newman movie of Nobody’s Fool, read the rest of Russo’s oeuvre – he is the king of the novel (a throne he shares with John Irving); visiting his domain always rewards the traveler. I would feel remiss if I didn’t add a quick note about my favorite novels of 2015 that I didn’t get to until this year: Lauren Groff’s Fates and Furies, Louis de Bernières’s The Dust That Falls From Dreams, and Rick Moody’s Hotels of North America. I should add, too, that I didn’t feel the need to put Colson Whitehead’s The Underground Railroad on this list, not after its National Book Award and run-away best-sellerdom, but I hope that readers who enjoyed it will explore Whitehead’s backlist, starting with the startlingly good (and unclassifiable) John Henry Days. In all, a remarkable year of reading, and it could get better in 2017: Arundhati Roy will release her second novel, a short twenty years after her Booker-winning debut The God of Small Things; George Saunders is publishing a novel, of all delights; and, if the spirits move her sufficiently, Hilary Mantel will publish the third volume of her Wolf Hall novels, to be titled The Mirror and the Light. Yes, I’m already working on my “Best of 2017” list; something tells me, if you’ve read this far, then you are, too. For more from Sean Kinch, check out his reviews at Chapter16.org, including pieces on The Noise of Time, Homegoing, Moonglow, and Here I Am. Sean graduated with a BA from Stanford and a PhD from the University of Texas and has taught English at Montgomery Bell Academy in Nashville since 2002. He organizes the 5th grade Quiz Bowl every Spring, then the prom. You’ll have to ask him which one is harder. Sean is a “very popular teacher known for his literary scholarship and his knowledge of popular culture, especially movies and all things basketball,” says one colleague. He can still drain the 3. Pictured at top, at Rosemary Beach (a favorite reading spot): Sean, Samuel, Katherine and Jill Kinch. What a wonderful list of books! I’ve been bouncing back and forth from this article to Audible to update my library. I was happy to see The Dust That Falls From Dreams included in the article. What a wonderful story that is. Knowing that the third book in the Wolf Hall series is on the horizon is a present in itself. This blog is a such a gift to all of us. Thank you, Jennifer! Such excellent suggestions and several messages from the universe to me in the wonderful Dr. Kinch’s picks here. (Julian Barnes is one of my favorite – loved The Sense of an Ending) Thank you and still rallying for parents to audit Senior English at MBA. Some of his students will not know until later how lucky they were but you can be sure their parents are fully aware and grateful for his brilliance. Great post today! Thanks for this great list! I will share with all of my book-loving friends.